Michael Wangia, MD is a Board Certified Dermatologist and Dermatopathologist. He earned his medical degree from Howard University, with election to Alpha Omega Alpha Honor Medical Society. He completed an internship at the University of Florida -Shands Hospital during which time he was awarded The Arnold P. Gold Foundation Humanism in Medicine Award. He also completed a residency in dermatology at the University of Florida, where he served as a Chief Resident and was awarded the Outstanding Resident Teacher Award by the Society of Teaching Scholars. Dr. Wangia completed a fellowship in dermatopathology at the University of Florida. During his fellowship he engaged in professional externships at the Cleveland Clinic (soft tissue pathology) and at the University of California San Francisco (melanocyte pathology). 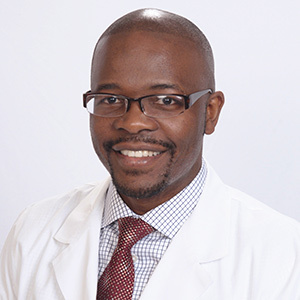 Dr. Wangia has served as an Assistant professor of dermatology at the University of Florida and has authored numerous peer-reviewed publications and presented at both local and national meetings. Dr Wangia is a Fellow of the American Academy of Dermatology, a Diplomate of the American Board of Dermatology and American Board of Pathology and a member of the American Society of Mohs Surgery and the American Society of Dermatologic Surgery. Clinical Interests: Dermatopathology, Cutaneous Oncology, Dermatologic Surgery, Complex Medical Dermatology (including lupus erythematosus, scleroderma, dermatomyositis and immunobullous disorders).